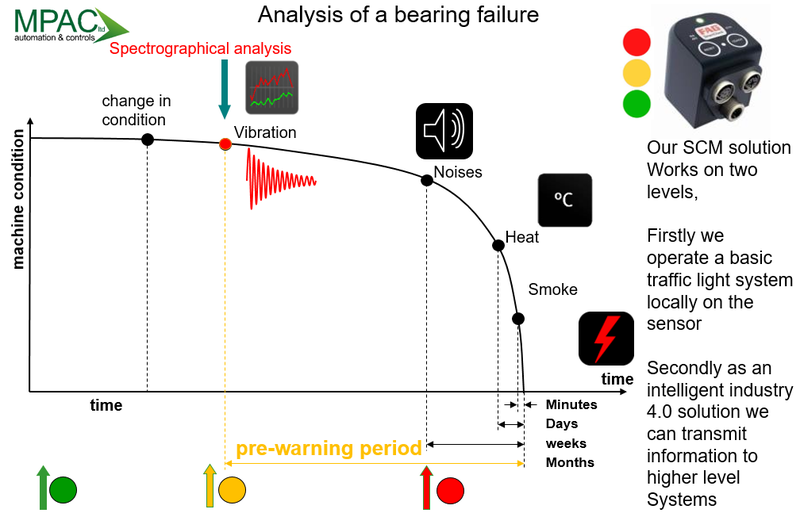 Condition monitoring is the process of monitoring the condition of machinery while in operation, with the goal of identifying when a change in condition occurs so that minor corrective measures can keep systems running before major failures occur. MPAC Ltd. have worked for years and developed vast experience in the area of predictive maintenance and condition monitoring. We have been carrying out condition monitoring inspections for customers for over 10 years. In that time we have developed an in-depth knowledge of which practices and procedures are best suited for which applications. Since 2014 we have been developing systems that go one step further, “Smart” condition monitoring systems which are installed on key plant and equipment and monitor in real-time 24/7 the important parameters that are vital to the integrity of your equipment and your business. This revolutionary system was developed between Mitsubishi Electric and Schaeffler the parent company for FAG bearings. FAG are one of the world’s leading bearing manufacturers and therefore have an unrivalled knowledge and understanding of vibration analysis for condition monitoring. FAG developed state of the art sensing technology which is unmatched in terms of its accuracy in monitoring and identifying vibrational frequencies which are emitted from every moving piece of equipment, different occurrences have unique vibrational signatures, the key to the success of this solution is its ability to automatically identify and separate the different frequencies and categorise them. No other system available can match this solution in terms of performance and features. Using FFT analysis “Fast Fourier Transformation” the sensor can monitor a piece of plant or equipment for many different problems. The complex time signal coming from the sensor is the sum of all vibration frequencies. If this time signal is ‘separated’ into the frequency components, those frequencies can be assigned to certain failure modes. 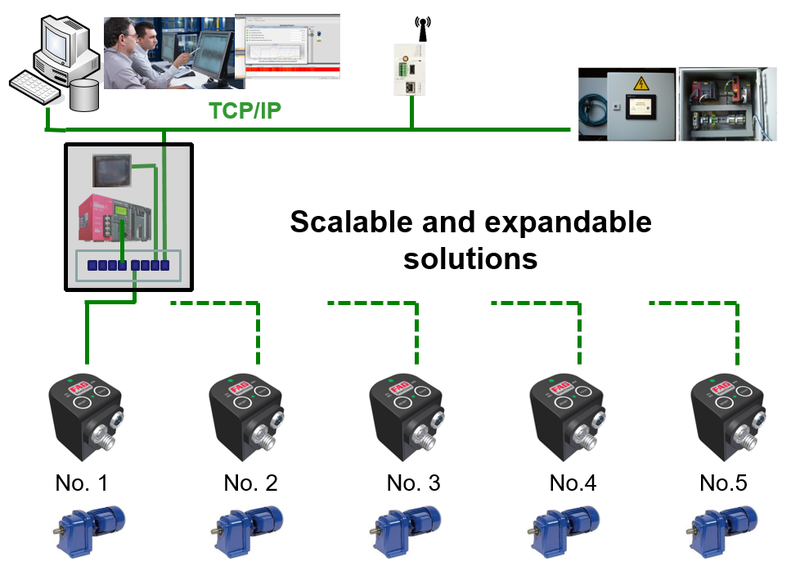 The sensor (or multiple sensors depending on the application) are connected to a Mitsubishi controller and HMI over an ethernet network. All the data from the sensor can be viewed on the HMI by operators and maintenance technicians. Some of the features available to viw on the HMI are as follows. Current status, Realtime measurement, 24hr average, Worst measurement since last reset, Historical alarms, Trending. 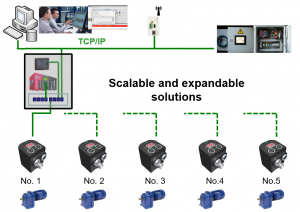 Our smart condition monitoring solutions can give your operation the benefit of forward vision. Allows maintenance and repair intervals to be extended (less maintenance). We can supply Smart condition monitoring to customers directly as a preconfigured unit ready for use or we can integrate the system for the customer as well as offering customised variations such as PC based monitoring, remote access HMI solutions, additional parameter monitoring etc.